How much depth can there genuinely be to the work of an artist who, to the un-attuned eye, seems to do little more with her practice than simply paint pairs of lips again... and again... and again? The answer to that would appear to us and her legions of fans to be, “quite a lot” – not least because there’s so much often-unearthed depth to the very concept of lips. A pair of lips can communicate so many things about the current emotions of their owner, but when colour is also applied to them, something especially remarkable happens: they are transformed into “powerful, sexual symbols”. Those are the words of Sara Pope, a British painter whose works are true symbols of seduction. In much the same way as one never tires of marvelling at the lips of a lover, so one is always wooed and entranced by the voluptuous, beautiful and glamorous lips that continually emerge from Pope’s studio. 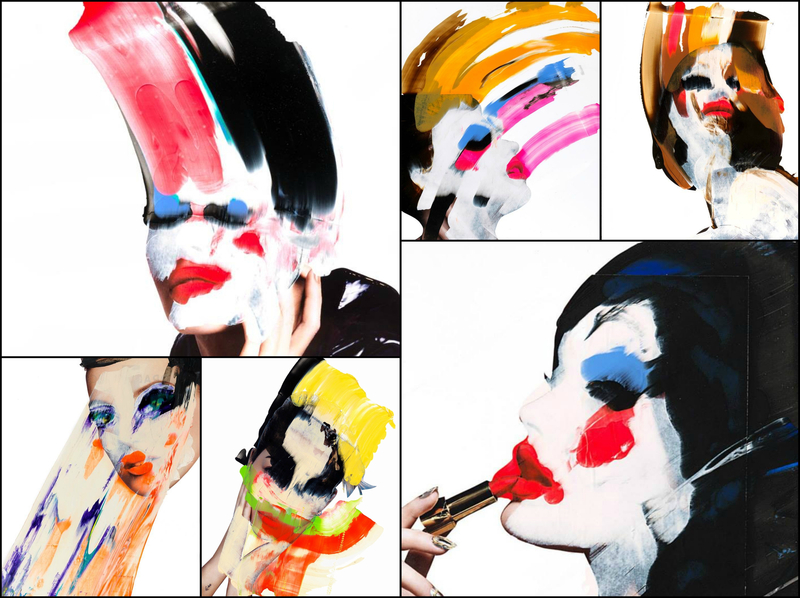 Rarely in the popular art of the 2010’s has the power of female lips been communicated so profoundly and succinctly as in Pope’s vibrant and unashamedly feminine creations. If, on surveying Pope’s works, you are put in mind of the slickness of advertising and the catwalk, that is very much by design rather than accident. Working in both oils and acrylic, Pope boldly embraces the boldest and most attractive colours and the high-shine gloss aesthetic of the other world that she has long inhabited: fashion. Indeed, Stoke-on-Trent-born Pope was a shoe designer before she was an artist, but prior to either of those things, she was studying mathematics at the University of Leeds, before feeling the urge to explore her creative side. It led her to take a Diploma in Fashion Footwear at Cordwainers, part of the London College of Fashion, from 2004-5, before becoming a magazine designer and art director for such companies as Hachette Filipacchi and Nat Mags. While living in Spain, Pope started customising and selling vintage shoes, organising Champagne/shoe parties and attracting attention in The Independent. This led to an association with avant-garde fashion designer Robert Cary Williams, who asked her to design a collection of shoes for his show at London Fashion Week. She has gone on to design shoes for a variety of high-end brands, including Lacoste and Paul Smith, in addition to freelance catwalk projects for such brands as Jasmine Di Milo and consultancy work for Pippa Middleton’s favourite shoe designer, Jemima Vine. For all of her renown as a shoe designer, however, Pope has since become much more closely identified with the world of contemporary art, on account of her works that provocatively subvert some of the fashion scene’s most treasured advertising techniques and motifs. While Pope’s pieces – bearing such titles as Pervette, Hove Actually, Lickable and Hard Candy – are certainly compelling in their own right with the questions that they raise about long-held beauty ideals and the transience of celebrity culture, even she might not have expected them to make such a great and wide-ranging impact. Pope only began to paint in the late 2000’s but has already experienced prodigious success in her still relatively young artistic career, including participation in exhibitions in London, Isleworth, Hove and Leeds in her homeland, encompassing such prestigious venues as the Royal Academy of Arts and Deutsche Bank. 2014 proved an especially momentous year for Pope, as she held her first solo show, Slick, at WorkHouse Modern in Harrogate, UK, as well as her first international show in Florence, Italy. It was while in the latter country that she also delivered her original portrait of Pope Francis to the Vatican for acceptance into the sovereign state’s collection. 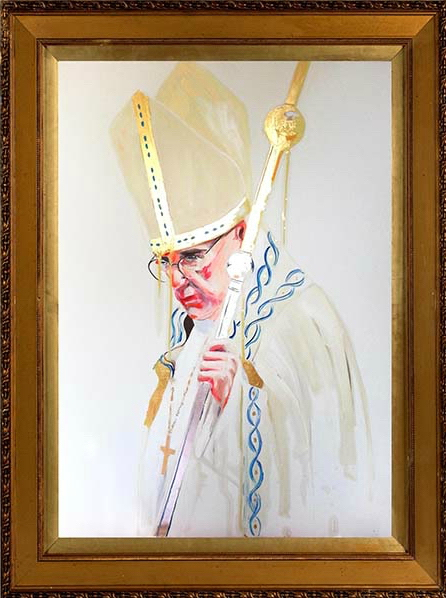 Arty-Fact: In Sept 2014 Sara Pope had the honour of having her portrait of Pope Francis accepted into the Vatican Collection. She is the first British female artist to have a piece of artwork accepted into the Vatican collection in over 70 years. The idea for the portrait began to take shape while preparing for her international solo exhibition at 166a Arte Gallery in Firenze, Italy, in order to commemorate the visit. Using both oil and acrylic paint, 23ct gold and silver leaf, and fluorescent colours, Saraʼs portrait is a very contemporary take on the Popeʼs portrait. Pope has continued to build on that momentum in the last few years with further shows at the likes of The Coningsby Gallery, The Exhibitionist Hotel and The Square Gallery in London. Another solo exhibition - #Gorgeous – is planned for the English capital’s Jealous Gallery in Shoreditch from 26th April to 21st May, with updates about her preparations able to be found in her Instagram feed. With such a formidable career built up in such a short space of time, it can be safely said that Pope’s work and success are about so much more than “a pair of lips”! 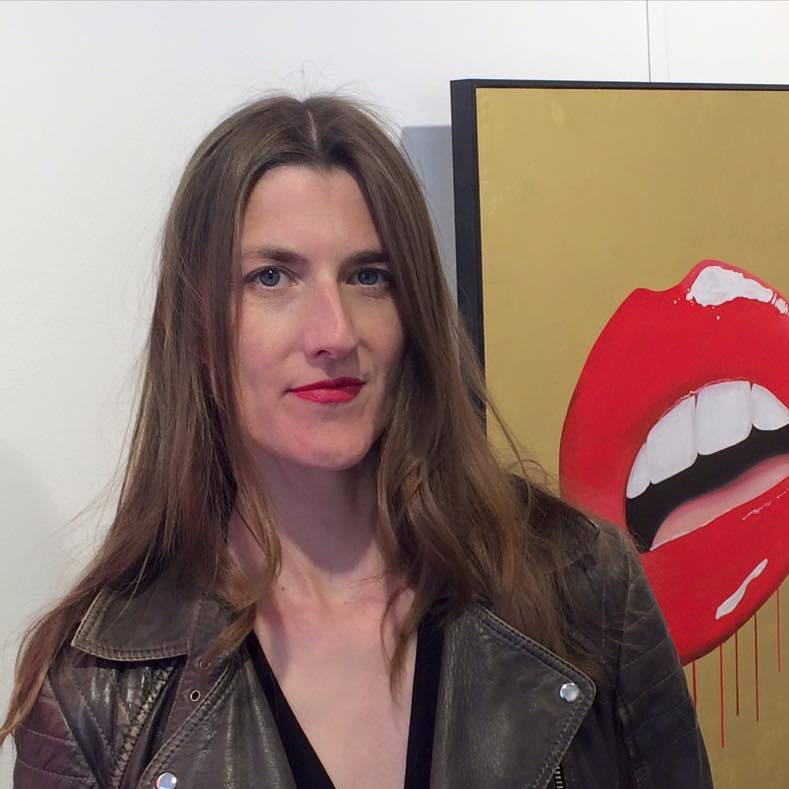 Here at Addicted Art Gallery, just one more of the many galleries with which she has been associated throughout her career to date, we certainly feel that she has been successful in achieving all of that – all the more impressive, given her lack of formal art training. 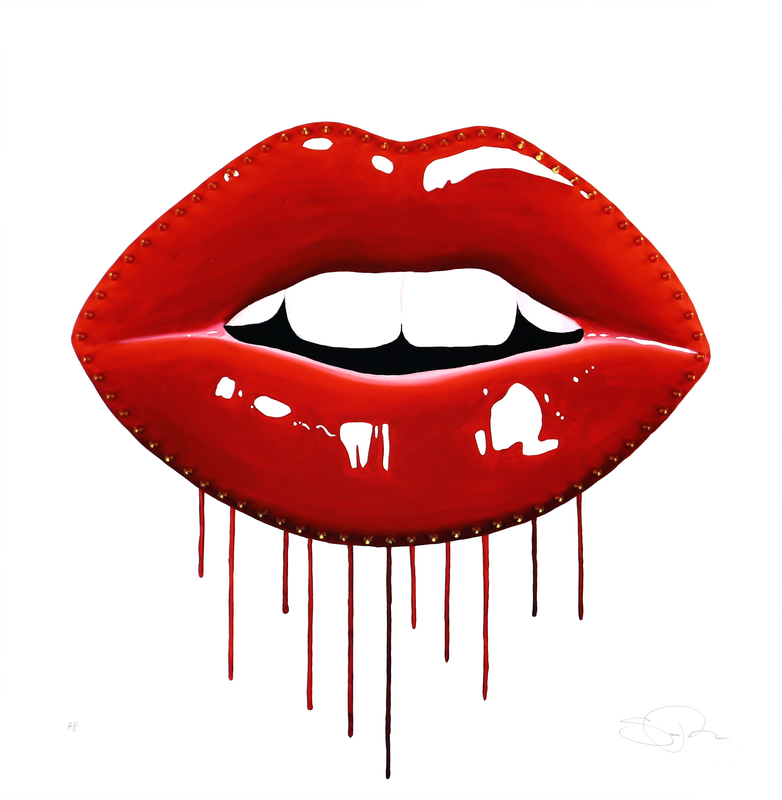 Let’s face it... no one does lips – and so much more in her art – quite like Sara Pope.